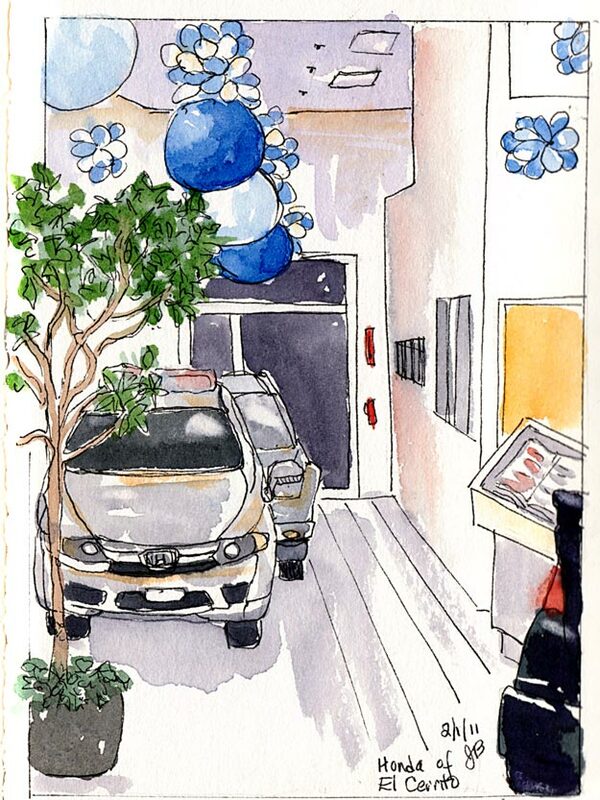 The El Cerrito Honda dealership was kind enough to allow our Tuesday night urban sketchers group to come and sketch in their showroom. There were chairs and tables for us to sketch and paint in comfort and interesting architecture and cars to draw. I remember boys drawing cars all the time but never thought that someday I’d go out of my way to draw cars too. The artist Rebeca Garcia Gonzalez told me that she likes including cars in her paintings because they remind her of jewel-like candies. In this post she not only included cars, but got a passerby to stand and pose for her and included him in the painting! I drew this car at the end of the evening and it was so close to me that it got way out of proportion and then started looking like a shark with whatever that thingee was on top. It’s good to develop the ability to see and draw cars because they’re everywhere, and leaving them out of a scene can look strange. Artist Beth Bourland told me a funny story about this car sketch on her blog. She kept working on her drawing after the cars drove away. Some passerbys looked at her sketch and then at the empty street in front of her, and back at the sketch, wondering if she was seeing things. 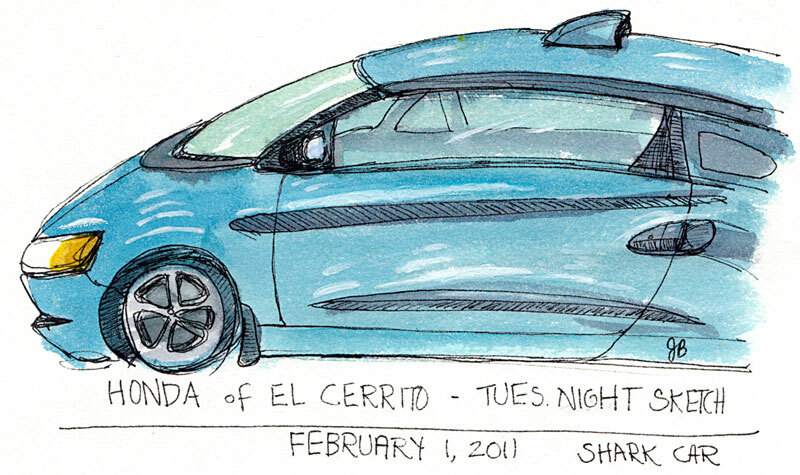 You can see Cathy’s Honda sketches on our Urban Sketchers blog here. As always, your post is interesting and with great sketches! It was a pleasure having you in the dealership and gave both our customers and staff a great deal of pleasure watching you turn our cars and showroom into works of art. We can’t wait for you to return!!! Great idea for getting car practice! At least these aren’t going to drive away on you! Wonderful sketches! Nice sketch, Jana. For some reason I have trouble getting cars right. I get caught up in the details and forget to deal with the large shape first… at least I guesss that’s what I do wrong, or maybe it’s just that cars have hard edges and my sketches of organic things turn out to be more believeable. Once again you have made me look at cars from an artistic point of view.